Acuvue Oasys for Astigmatism are bi-weekly toric contacts by Johnson & Johnson. They are equipped with stabilising technology, UV filters, and are available here as a package with Laim-Care solution. Acuvue Oasys for Astigmatism are bi-weekly toric contact lenses produced by Johnson and Johnson and are an upgraded version of the brand's Acuvue Advance for Astigmatism lenses. 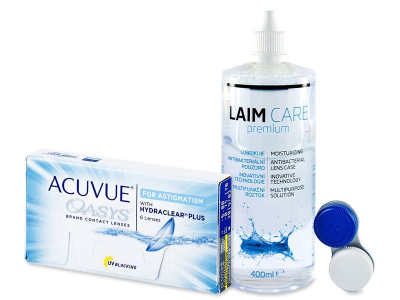 The manufacturer affirms wearers may switch from Acuvue Advance to Acuvue Oasys without needing to visit an optometrist if all parameters of the lenses remain the same.